(1) Wherever Jesus appears, there is salvation. If He sees a revenue officer sitting in his office, He makes him an apostle and evangelist. Laid in the grave, He raises the dead to life. He bestows sight on the blind, hearing on the deaf. When, as now, He visits the public baths, it is not out of interest in the architecture, but to heal the sick. (2) By the Sheep Market in Jerusalem there used to be a pool with five colonnades, four of which enclosed the pool, while the fifth spanned it midway. Here large numbers of sick would lie (unbelief also was rise among the Jews). The physician and healer of both souls and bodies showed fairness in choosing this chronic sufferer to be the first recipient of His gift, that he might the earlier be released from his pains. For not for one day only, nor for two, had the poor man lain on his bed of sickness – nor was it now the first month, no, nor the first year – but for eight-and-thirty years. His long-standing illness, rendering him a figure familiar to passers by, now made him ocular evidence of the power of his healer. For the paralytic was known to all by reason of the length of time. But though the master physician gave proof of His skill, He was rebuffed by those who put an unfavourable construction on His work of mercy. (3) As He walked round the pool, “He saw.” He did not elicit the information by asking questions, for His divine power obviated any such need. Not “asking,” but “seeing” how long the invalid had lain there; “seeing,” He knew; indeed He knew before He saw. For if in the case of secrets of the heart “He had no need to question anyone concerning man, for He Himself knew what was in man,” much more was this the case when it was a question of diagnosing diseases with visible symptoms. 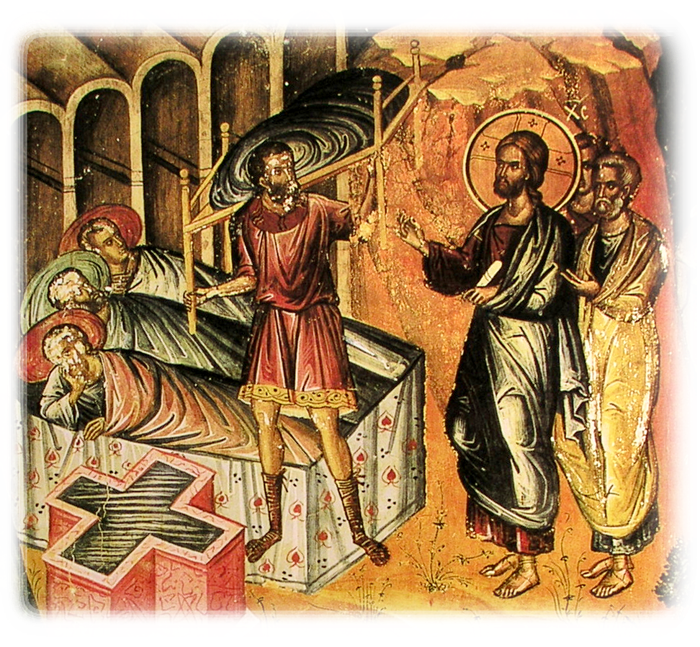 (4) He saw a bedridden man weighed down by a sore sickness; for the paralytic’s heavy load of sins aggravated the long-drawn agony of the disease. A question addressed to the sufferer hinted to him his need: “Wilt thou be healed?” Not a word more; He left him with the question half spoken. For the question was ambiguous; it was because he was sick not only in body but also in soul (compare His later saying: “Behold, thou art cured; sin no more, lest something worse befall thee”) that He asked him: “Do you want to be healed?” What mighty power that implied in the physician, making relief depend only on the patient’s willing! It is because salvation is from faith that He asked “Do you want to be healed?” that his “Yes” might give Jesus His cue. This “Wilt thou?” is the word of Jesus only; it belongs not to doctors who heal the body. 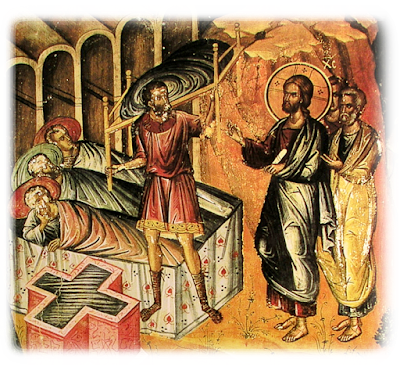 For those who treat bodily ailments cannot say to any and every patient: “Wilt thou be healed?” But Jesus grants the will, accepts the faith, and freely bestows the gift. (5) Once when the Saviour was passing by, two blind men were sitting by the roadside. Though their bodily eyes were sightless, their minds were open to the light. The blind men pointed out Him whom the Scribes did not recognise. For the Pharisees who, for all that they had been taught the Law – yes, had studied it from childhood to old age – had nevertheless grown old still uncomprehending, now said: “As for this man, we do not know where he comes from” (for “he came unto his own, and his own received him not”). But the blind men kept on crying out: “Son of David, have mercy on us.” Those whose eyes did not serve them to read knew Him whom the students of the Law failed to recognise. Going up to them, the Saviour said: “Do you believe that I can do this for you?” and “What will you have me do for you?” He did not say: “What will you have me say to you?” but “What will you have me do for you?” For He was a doer, a maker – a giver of life, too – not now beginning to do for the first time (for His Father works always, and He works with His Father); He was the maker of the whole world at His Father’s command. Alone begotten, without intermediary, of the Alone, He questions the blind men, saying: “What will you have me do for you?” Not that He did not know what they wanted, for it was obvious: but he chose to make His gift depend on their answer, that they might be justified out of their own mouths. The reader of hearts could not be ignorant what they would say; but He waited upon their words; now His question was their cue. (6) He stood by the cripple, the doctor visited the sick man, nor is it so strange that He condescended to attend the invalid by the pool, for had He not visited us from Heaven? He asked him: “Wilt thou be healed?” by the question leading him on towards the saving knowledge, raising a question in his mind. A gift, truly, of grace! No fee was charged; else the patient would not have had the physician coming to him. He said to Him: “Yes, sir; for the long duration of my illness makes me desire health; but, desire it as I may, I have no man…” Do not lose heart, my good fellow, because you “have no man”; God you have standing by you, One who is at once man and God under different aspects; for both must be confessed. The confession of the humanity without the confession of the divinity is unavailing, or rather earns a curse. For “cursed is he who puts his trust in man.” So with us: if, hoping in Jesus, we hope in the man only, not including the divinity, we inherit the curse. But as it is, we confess both God and man, and both truly: in worshipping Him as God truly begotten of the true Father and as man not merely in appearance, but really and truly born, we receive a real and true salvation. (7) “Yes, I do want to be healed, but I have no man…” Maybe it was because of his dire straits that Jesus came to his rescue. For the generality of the sick had relatives, friends too, and maybe other helpers. But the poor cripple, crushed by a literally universal want, utterly destitute, abandoned, alone, found the Son of God, the Only-begotten, coming to his aid. “Wilt thou be healed?” “Yes, Lord, but I have no man, when the water is troubled, to put me into the pool.” No, but you have the spring itself. “For with thee is the fountain of life,” the fountainhead of all fountains. “He who drinks of this water, out of his belly shall flow rivers,” not of the water that flows downwards but of that water that springs up – for the spring inspired by Jesus’ draught, unlike man’s puny leap which lands him back on earth again, carries us up to the sky; the water “bubbles up unto life everlasting.” Jesus is the wellspring of all blessings. Everywhere the Saviour becomes “all things to all men”; to the hungry, bread; to the thirsty, water; to the dead, resurrection; to the sick, a physician; to sinners, redemption. (10) “Rise, take up thy pallet and walk.” But first rise, cast away your sickness; afterwards you can put muscle on faith. Exert your strength first upon the bed that used to carry you; learn to carry away on a wooden stretcher those passions by which you were for so long carried away. He was ordered to carry his wooden litter by that Saviour of whom it was said: “The King hath made him a litter of the wood of Lebanon. The pillars thereof he made of silver, the seat of purple, the inside paved with mosaic.” The imagery represents the Passion, this imagery reserved in the Song of Songs for sober and chaste bridals. For you must not, accepting the vulgar, superficial interpretation of the words, suppose that the Canticle is an expression of carnal, sexual love. No; it is the language of bridals with an immortal Lover, bridals pure and chaste. If you do not divine the sense of the Canticle, go to the book of Proverbs. Make an indirect approach, mounting by degrees to the Canticle. “Wisdom hath built herself a house,” it says, as though speaking of a woman, “and hath sent her servants.” Elsewhere it says: “Love her, and she will protect thee.” This is not the love of woman, but of wisdom, which drives out carnal love. For where wisdom is stored, there carnal love is banished; not passions but wise thoughts house with wisdom. “They are become as stallions frenzied in heat”: an urge unworthy of reason. If, then, in the Canticle you hear talk of a bride and a bridegroom, do not read into such language a reference to sexual passion (that would be to fall back to earth), but sublimate the passions by the passionless. (12) “The coverings of purple.” Therefore they also “clothed Him in purple”; in mockery, of course, but fulfilling the prophecy; doing it under inspiration, for He was a King. However much they did it in a spirit of derision, still they did it; His royal dignity was emblematically heralded. So, likewise, though it was with thorns they crowned Him, it was still a crown. And it was soldiers who crowned Him; kings are proclaimed by soldiers. “The covering of purple, the inside paved with mosaic”: the devout children of the Church know Lithostrotos or “Gabbatha” in Pilate’s palace. (13) But this is a digression; when on the subject of the pallet, I was led on to speak of the litter in the Canticle. He said, therefore, to him: “Rise, take up thy pallet and walk.” The disease was long-standing, the remedy swift. The paralysis had lasted for years; the strengthening of the sinews was instantaneous. For the creator of the sinews, He who provided a variety of remedies for the blind, He who gave that incongruous salve by anointing with clay (for a plaster of clay, applied to sound eyes, deprives them of sight, but Jesus by means of clay bestowed sight upon the blind)…His power reached others by yet other means. Where He simply said: “Rise, take up thy pallet and walk,” what astonishment, do you think, seized the beholders! Yet, marvellous as the sight was, it was the faithlessness of the onlookers that was really strange. A years-old disease is healed, but an obstinate incredulity was no healed. Instead the Jews’ malady persisted; they did not want a cure. (14) If they were right to be amazed by the incident, they should have gone on to adore the healer of bodies and souls. But they murmured; for they were the children of murmurers, of those who twisted good into evil, calling bitter sweet and sweet bitter. It was quite in accordance with the divine “economy” that Jesus worked on the Sabbath, performing deeds transcending the Sabbath, that the deed might convince. It was because an assertion can be met by a counter-assertion, while there is no answer to the deed, that He used to heal on the Sabbath; the lesson is, instead of relying on arguments, which only provoke counterarguments, to let deeds convince the onlookers. (18) Let no one, then, be “in the flesh”; but, being in the flesh, let him not walk according to the flesh. The Apostle does not mean that, to avoid sin, we should withdraw altogether from the world, but that, being in the flesh, we should make the flesh our servant and not be ruled by it. Let us not be slaves, but masters, in our own house. Let us be moderate in our eating, not allowing ourselves to be carried away by gluttony. So bridling our appetite, we shall govern also its henchman, lust. Let the soul rule the body and not be at the beck and call of animal instinct. (19) Let everyone, then, give ear to Jesus and “sin no more.” Let us, rather, hasten to the great Pardoner. Are we ill? Let us have recourse to Him. Is it a sickness of the soul that ails us? Let us become disciples of the physician of knowledge. Are we hungry? Let Him give us bread. Are we dead? Let Him raise us to life. Have we grown old in ignorance? Let us beg wisdom of Wisdom. (20) But my sermon has betrayed me into wordiness, and I am, maybe, standing in the way of its practical lesson. God grant that all of us may heed the Saviour’s words, that, aided by mightier works, we may send up our praise to God, to whom be the glory now and forever, through all eternity. Amen. From The Works of Saint Cyril of Jerusalem, vol. 2, Anthony A. Stephenson (trans. ), Washington, D.C.: The Catholic University of America Press, 1970, 209-222.